One thing I love most about seeing hot air balloons up in the sky is how they always have such bright fun patterns. 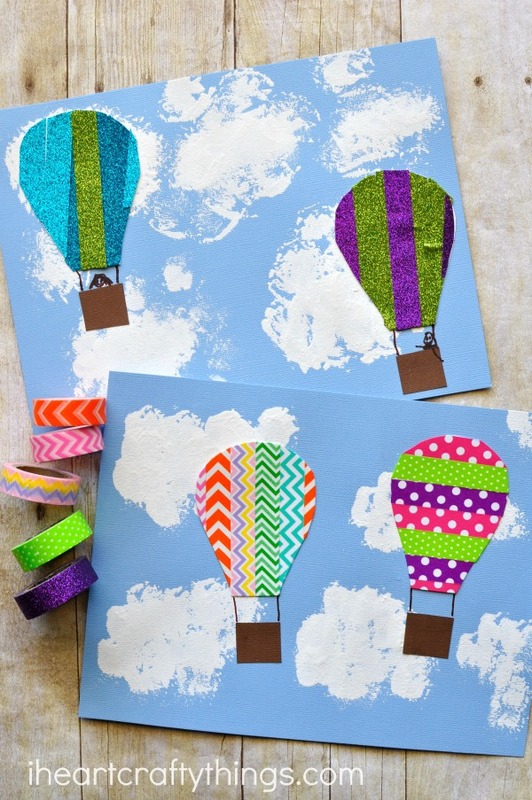 My daughter and I got crafty this week designing our own patterned hot air balloons with washi tape. 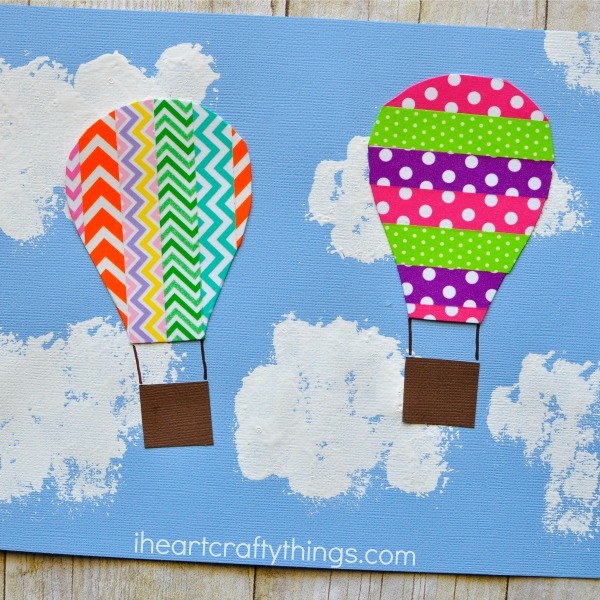 We added in an extra fun component to the craft by painting puffy clouds with pom-poms which I know your kids will enjoy. 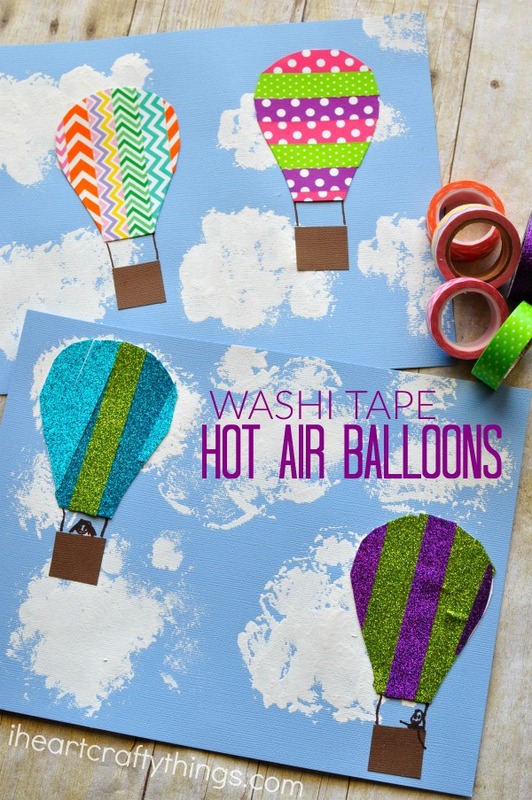 This fun washi tape hot air balloon craft is perfect for a summer afternoon craft and it works great for kids of all ages. This post contains affiliate links for your convenience. Read our disclosure policy for more information. 1. Start by opening up your clothespin and grasping the large pom-pom. This is going to be your paintbrush for painting the clouds in the sky. Pour some white paint onto your paper plate. Dab your pom-pom into the paint and then onto your blue cardstock paper. Continue dipping into the paint and back onto your blue paper to make clouds all over your paper. Set it aside to dry completely. 2. 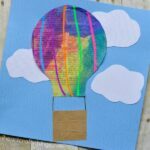 Cut a hot air balloon shape out of your white cardstock paper. Use that as a pattern to cut out as many balloons as you want. We used two per craft, but I kind of wish we would have done three. It will also depend on how big you make them. 4. 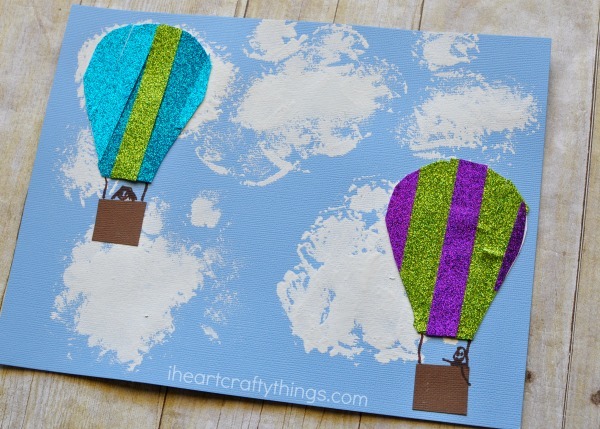 Put some glue on the back of your hot air balloons and glue them onto your cloud background. 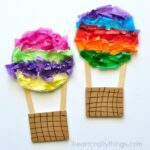 Cut out small hot air balloon baskets from your brown cardstock paper and glue them under your hot air balloons. 5. 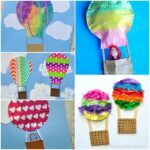 Finish your washi tape hot air balloon craft by using a marker to connect your basket to your hot air balloon. If you notice in the pictures, my daughter decided to draw people in her baskets which I absolutely adore! So get creative as you want with your markers, any details you choose.